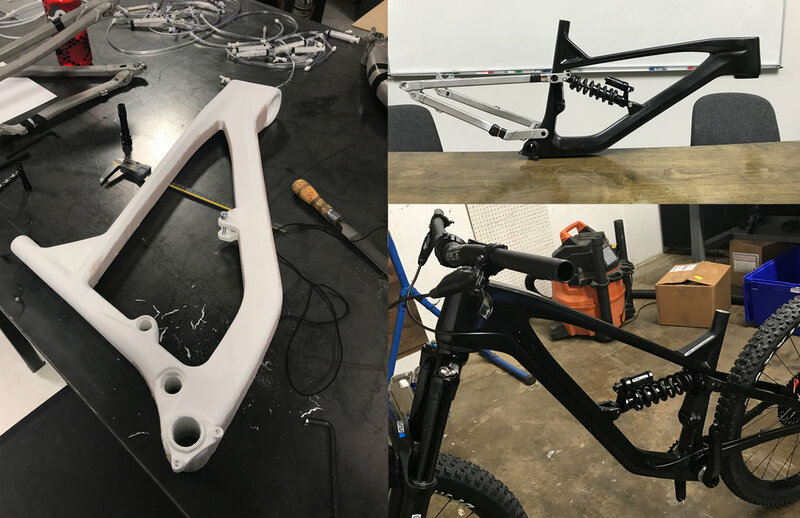 In early 2018 we began working with Guerrilla Gravity on their newest line of bikes. The design aimed to incorporate new materials, features, and geometry while maintaining their signature look. As a team we developed the new concept from sketch to manufacture. Guerrilla Gravity was in the process of switching their bike lineup from aluminum to carbon. The specific method of carbon manufacturing is also new to the industry. This meant that new form factors were on the table for both function and aesthetics. We wanted to keep certain features of the previous design to continue their distinct look in comparison to other bikes. We worked around the parameters of standover height, shock clearance, water bottle space, and other factors to refine the geometry. We began the design process through sketching. We used CAD to visualize the form in 3D and to modify the geometry so that it would fit all the necessary components. This also allowed us to create renderings to study the proportions and overall aesthetics of the design. Once the CAD was refined, we were able to create a full scale 3D printed model (shown below). This model was sanded and finished to give it a more realistic appearance and was mounted to other components. This helped verify mechanical clearances and fit as well as the physical appearance of the bike. We began designing molds for the different sizes of bikes using the existing CAD models. The photos below show one half of the mold and the finished product on the right side. The geoadjust headset allows for small size changes based on user preference. The bike is available in different frame sizes for various heights of riders and also features interchangeable rear triangles which allow for different models within the same platform.